The New York Giants stumbled upon a diamond when they drafted Odell Beckham Jr. with the 12th overall pick in 2014. The LSU product has been nothing short of outstanding since he began his professional career, and has become a household name and a staple on fantasy football rosters nationwide, all before his 23rd birthday. Football fans will remember his now-legendary three-fingered catch against the Cowboys in Week 12 last season, which play-by-play announcer Cris Collinsworth said "might be the greatest catch I've ever seen in my life." Not only does OBJ bring flash to the gridiron, he brings the performances to back it up. Beckham Jr. had one of the greatest rookie seasons any wide receiver has ever had in 2014, and the record books can prove it. 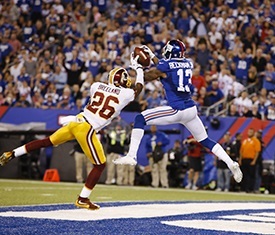 On Thursday night, as the Giants defeated the division rival Washington Redskins 32-21, Beckham broke another NFL record in what has become a usual, expected footnote for Giants fans watching the star wideout. Odell has already collected plenty of Giants franchise records, but let's take a look at the 13 most impressive NFL records that No. 13 has claimed in his young career. And don't forget he's accomplished all of these after missing the first four games of his rookie season with a hamstring injury. 1) Most receptions (110) through the first 15 games of his NFL career, achieved after Thursday night's seven-catch, 79-yard performance. 2) First and only rookie in NFL history with at least 50 receptions at home during his rookie season. 3) Fastest player in NFL history to reach 100 career receptions (14 games). 4) Highest average receiving yards total per game for any rookie ever (108.8, set in 2014). 5) Only rookie to have at least 11 receptions in consecutive games in NFL history (Weeks 13 & 14 in 2014). 6) Only rookie to catch at least 12 balls, with 140-or-more yards and three touchdowns in one game (Week 14). 7) Most receiving yards in a single calendar month for any rookie in history (606), which he did December of 2014. 8) Youngest player in league history (22 years, 53 days) with multiple games of 10-or-more catches in a single season (4). 9) Most games of at least 125 receiving yards in a rookie season with six. 10) Only rookie in NFL history with five games of 90-or-more yards in a single month (November, 2014). 11) He is the only player in NFL history to rack up at least 1,300 yards receiving in 12-or-fewer games in a season. Not just for any rookie, but any receiver, ever. 12) Only rookie to have more than one game with at least 125 yards, 10 catches and a touchdown in a season. Odell Beckham Jr. didn't just do it twice. He did it four times. 13) He is the only rookie to post a season of at least 75 receptions, 1,100 receiving yards and 10-or-more touchdowns in NFL history. The New York Giants may have gotten off to a 1-2 start in 2015, but as long as Eli Manning can still throw the ball, and Odell Beckham Jr. is on the field, there is always a touchdown threat looming.